Is the U.S. retail sector crumbling, or is it merely evolving? Several major retailers recently missed Wall Street expectations during their latest quarterly reports. Their stocks were punished with double-digit declines, while concerns about slowing consumer spending -- which has often heralded recessions -- dominated financial headlines. But before investors panic, they should take a closer look at the companies which missed the mark to recognize three key trends. Several major apparel retailers recently reported sliding comparable store sales. Gap's (NYSE:GPS) first quarter comparable sales fell 5%, dropping 6% at Old Navy, 3% at Gap, and 11% at Banana Republic. Guess (NYSE:GES) expects its constant currency comps to fall 0.5% to 1.5% when it reports its earnings on May 25. Teen apparel retailer Aeropostale, which once competed against Gap and Guess, filed for bankruptcy protection in early May. However, "cheap chic" players like H&M and Forever 21 are faring much better with cheaper price tags, warmly received styles, and briskly rotated designs. Last year, H&M's sales rose 19% annually to 210 billion Swedish krona ($25.4 billion) as after-tax profit rose 4.5% to a record high of 20.9 billion krona ($2.5 billion). Forever 21 is privately held, but the company's revenue reportedly rose 16% to $4.4 billion in 2015. By comparison, Gap's net sales fell 4% last year as net income plunged 27%. Guess' sales and earnings also fell year-over-year. Therefore, the retail apparel sector isn't dying -- it's simply being disrupted by a new generation of cheap chic players. To make matters worse, Amazon (NASDAQ:AMZN) recently started selling its own private label apparel brands, which could eventually take a bite out of these retailers' e-commerce sales. Speaking of Amazon, the e-commerce giant helped boost Internet retail earnings across the S&P 500 by 143% annually during the first quarter, according to FactSet. Meanwhile, earnings in many retail sub-industries selling goods which could be purchased on Amazon suffered. Home furnishing retail earnings fell 7.5%, hurting companies like Bed Bath and Beyond. Consumer electronics retail earnings dropped 14%, hitting retailers like Best Buy. Retail earnings from hypermarkets and super centers also declined 14%, dragging down chains like Wal-Mart. Department store earnings plummeted 48%, crushing struggling retailers like Macy's. But those declines aren't red flags for a recession. They merely indicate that consumers are now doing much more of their shopping online. A simple comparison of Amazon's revenue growth against all those aforementioned retailers over the past decade reveals how futile that struggle has been. 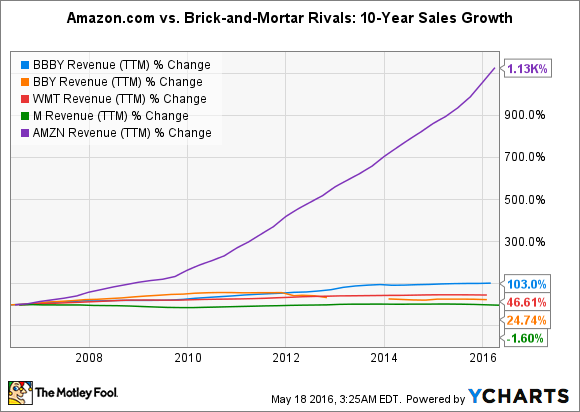 That chart seems to indicate that Amazon and other e-tailers will eventually wipe out most brick-and-mortar players, but there are still pockets of growth which Amazon can't touch. Home improvement retailers, which posted 12% earnings growth during the first quarter, have been spared for three reasons -- customers generally like to test the products out, the products are often too expensive to ship over long distances, and they need to be installed. That's why Home Depot (NYSE: HD) posted 7.4% comps growth in its U.S. growth last quarter, which boosted overall sales by 9%. Certain grocery stores (not hybrid super centers) also grew with an average of 4.5% earnings growth during the first quarter, thanks to Amazon's limited reach in fresh groceries. Kroger (NYSE: KR), for example, posted identical-supermarket sales growth of 3.9% (excluding fuel sales) last quarter, marking its 49th consecutive quarter of positive identical-store sales growth. However, investors should be aware that Amazon is aggressively expanding AmazonFresh to new markets. If the service reaches more areas and Amazon lowers its price, grocery stores could start feeling the same pain as other brick-and-mortar retailers. Many retailers have fared poorly so far this year, but most of their troubles can be attributed to competition and changes in shopper behavior instead of a slowdown in consumer spending. In fact, the U.S. Commerce Department recently reported that overall retail sales rose 1.3% between March and April, marking its biggest monthly gain since last March. The University of Michigan also recently reported that consumer sentiment had reached 95.8, which far exceeded the analyst estimate of 90 and represents its highest level since last June. Those numbers certainly don't indicate that a recession is brewing. Instead, investors should be selective with the retail stocks they buy. Checking if a company is vulnerable to nimble rivals or e-commerce giants can mean the difference between picking a winner or loser in this constantly evolving market.